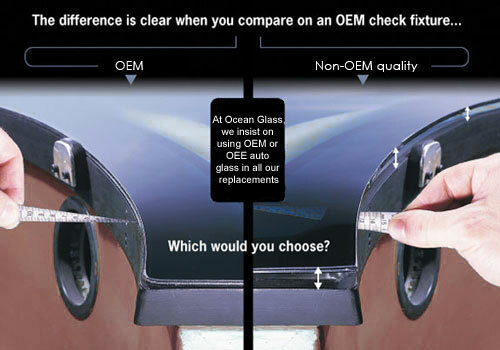 At777 Auto Glass, we always recommend replacing broken auto glass with OEM or OEE quality glass. OEM auto glass is what the Original Equipment Manufacturer (in this case, the vehicle manufacturer) calls for in the original design. This is the auto glass that comes installed in the vehicle when it comes off the assembly line. OEE, Original Equipment Equivalent, is glass that may be from a different manufacturer, but it's still made specifically for a particular make and model. Having OEM or OEE replacement windshields and windows are essential to ensuring the glass fits and seals perfectly. With aftermarket auto glass, the piece of glass installed may fit dimensionally, but it's not made specifically for that particular vehicle. Rather, it's made in a "generic" way that makes it "usable" for many makes and models. So you're probably asking yourself, "Why does this matter?" Well, as you may already know, your vehicle's windshield is an important part of the safety components of your vehicle, and not having a perfect fit means your windshield may be the weakest link in keeping you and your passengers safe! In addition, using sub-standard replacement windshields increases the chance the glass will leak, cause wind noise, and create other issues. To avoid these headaches and potential disasters, insist on OEM or OEE-quality auto glass.